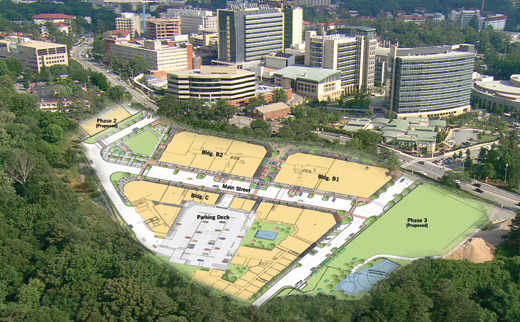 Atlanta-based Cousins Properties will begin work on Phase 2 of Emory Point in September. I've had a story in draft form about this for around a year, but a recent story by Collin Kelley of Atlanta Intown gave me the push I needed to get this puppy published. I was invited for a walk around of the project as Phase 1 was just getting underway and was informed of the potential plans for Phase 2 should Phase 1 meet expectations. With reports that existing Gables apartments are 75% leased and few retail opportunities left, the decision was made to greenlight the second phase. Kelly breaks down the developer's plans in terms of additional retail and residential components. Cousins will reportedly add "300-plus luxury apartments and an additional 40,000-square-feet of retail space" in Phase 2 of the project. Though the piece is rather informative, Kelly did not mention that Phase 2 will mean the demolition of the Emory Inn, a quaint lodging option on Clifton Road that dates from 1962. The Emory Inn is owned by Emory University but is managed by Crestline Hotels & Resorts along with its neighboring, newer property, the Frank Lloyd Wright inspired Emory Conference Center Hotel. The Emory Inn is described as offering a "quaint, country French setting" ands features 107 guest rooms. By comparison, the Emory Conference Center has 325 guest rooms and 32,000 square feet of meeting space. Le Giverny, a popular local French inspired eatery, was located on the inn's lobby level, but it closed last month. My question is, with the CDC and Emory so close, why would Cousins not replace the inn with a hotel? The area is already severely underserved in terms of hotel rooms, and to reduce the room inventory without replacing it seems illogical at the very least. Other than the aforementioned Emory Conference Center, a Holiday Inn Express on North Decatur near Clairmont Road, and recently renovated Marriott Courtyard in downtown Decatur, there are really not many accommodation options. Emory and Agnes Scott parents and/or families, before, during or after graduation, plus the CDC, and the VA, have a need for hotel rooms that is not being met. Many of these guests end up staying in Midtown or Buckhead, but should a viable option be built, might very well stay in the Emory area instead. As much as I'd love for an Andaz (Hyatt brand) Standard, Ace or an SLS to open, these boutique hotel brands might prefer city locations. I think even something like a Courtyard by Marriott or an Aloft from Starwood could not only do well, but could thrive if they were added to the project. Currently, the Inn is slated to close September 4th. It will be very interesting to see what new restaurants or retailers are added to the project in its second phase. Early winners like The General Muir and Tin Lizzy's are proving successful, while concepts like La Tagliatella, an Italian eatery and Strippaggio, offering gourmet olive oil and vinegars, are not faring quite as well. Fast casual Indian concept Paradise Biryani Pointe is currently under construction on the Clifton Road facing side of Phase 1, and after a number of delays, should be open in about a month. There were rumors of a grocery component being added, possibly The Fresh Market or Sprouts Farmers Market, but I have been unable to substantiate either of these at this point. 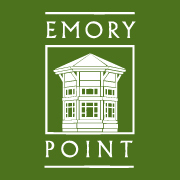 What would you like to see on in Emory Point Phase 2? What is your favorite concept in Phase 1 of the project? If a grocery component were added, who would you most like to see open? Please share your thoughts below. I can't think of a better location for a Trader Joe's -- would capture Emory, Decatur, Toco and Northlake. No brainer imho. Fish gotta swim, birds gotta fly, and somone's gotta mention Trader Joe's every time there's a DeKalb County development larger than a backyard treehouse. In a way, the consistency is reassuring. Good point about hotels Eli. I think a few pieces of land on Clairmont near the west campus entrance would be ripe for re-development as a hotel, although none of the trendy ones you mentioned. Just a La Quinta or Fairfield Inn. I wonder how many families stay over in Executive Park and across 85 at Doubletree/Hampton, etc? There's a lot of hotel rooms over there surprisingly and out of towners to Emory tend to take that route from the airport to campus via N. Druid not via Ponce or other confusing ways for an out-of-towner. All that said I'm sure a Hampton Inn or other brands like it would do great. They should lop off the Sherwin Williams end of the 2-story Kroger and put it there. Very ample parking so I doubt it would require any deck. I think a hip, quality boutique hotel would do great in downtown Decatur. I visited Emory for college search years ago, and we stayed in midtown because of the dearth of mid-range hotels near campus. University Inn is still going strong. Doesn't seem like nearly enough room inventory in the area (nor nearby Decatur), though. The addition and renovation of the Emory Conference Center Hotel 5+ years ago was to basically replace the hotel rooms from the old Emory Inn once it was demolished. In the INtown story, the Cousins representative said they were exploring the option of having a large "single-user" for this phase. Although he would not go into details, this could very well be another hotel, a supermarket or some type of department store. We'll be following up on this story in the weeks to come. Trader Joe's would be best. But perhaps that would be better in Phase 3 development bc that's a great deal of space. A hands down winner would be either a Trader Joes as the closest in Vi-Hi and always packed or Sprouts. I visited the Mt Vernon site weeks ago and was blown away. The best description is a Whole Foods at haf the cost. Either one is perfect.